My very first vlog is up online for the whole world to see and judge me quite harshly on. I’ve never done any type of videos before, so it’s not very good at all. But, I enjoyed making it and trying something different that I can hopefully get better at. So far this month, I have painted my nails thirty-one times. I haven’t brushed my hair. I ate six pints of Ben and Jerry’s Phish Food. And only cried twenty-two times. Mostly during TV shows, four times during HeyClaire’s video to her mom. I started off the month by falling out of love and hiding it quite intensely. I didn’t realize it would take me three months and not responding to texts to finally get over someone. But, I stopped answering phone calls and text messages and left things to the last minute before canceling again. It’s still something I’m continuing to work on, but not very well. June is always lonely for me. I used to love the summer as a kid, but the older I get the more I long for the Fall and new beginnings instead of the excessive heat of summer and my clothes sticking to the backs of my legs. Yet, this month was about rain, and more rain, and the continuous monotonous rain. But then it became about the starts of projects and songs and books and movies and TV shows and candles and lots and lots of candles and friends. Actual friends. Which is strange for me to not have everyone I want to hang out with spread across the globe, but a small group I can call and go to a movie and dinner with. It became about learning new things and juggling three jobs and slowly trying not to lose my mind in the process. June, you’ve been about learning to take chances and not be so scared to take the next step. I have been so scared lately. Scared to make the wrong step and ruin my life forever, but JK Rowling didn’t have her life figured out by 23 and I’ll figure it out one day. I hope. Maybe in July. *went off on a different course whilst speaking, but this was the main idea. I could hear them giggling behind me as I struggled to get my oversized bag situated and my feet planted on the pedals of the recently rented city bike. I hadn’t been on a bike since I was fourteen, and now, six years later, I was perched on one at two in the morning in Nice. Antoine was looking at me, a slight smirk on his face as I finally balanced myself and unsteadily propelled myself forward. “Ça va?” he asked and when I nodded, we were off, looping around the winding streets back towards the city centre. There were four of us, peddling faster and faster trying to see which one of us could beat the other down the hill. Pierre with his long dark hair and coke bottle glasses appeared beside me, stretching his legs out in front of him, weaving the blue bike from one side of the road to the other. “Allez,” Pierre turned, “we are the motorbike gang. Please, Mackenzie, we need a girl in our gang which means you need to pedal faster.” I laughed and worked my legs into a frenzy, flying fast along the winding road, seeing the sea glitter in the moonlight at the bottom of the hill as the “motorbike gang” laughed hysterically through the empty streets. Nice was beautiful in the daytime, with the streets milling with both tourists and natives alike. At night, streets were lit with a warm yellow glow while music could be heard from the few clubs that were open. Girls in small dresses, smoking cigarettes outside while speaking rapidly about some boy they couldn’t believe didn’t show up. It could have been any city, but the quick French and late night crêpe stands gave away the location. Nice in the daytime meant weaving through backpackers and old men in khaki shorts, their striped polos tucked into the front of their trousers. Yet at night, there weren’t tourists with “selfie sticks” standing around the Fontaine du Soleil, but young couples sharing secret jokes, kisses, and wine. I smiled as we passed them, Antoine whistling loudly, as the couples parted and laughed in their hands. The sea crept closer as my legs grew more tired with each turn of the pedals. Antoine and Chris were in front of Pierre and I, they turned their heads, laughing at us to move faster, the beach was waiting. Two days before, when I arrived at this sea town in the south of France, finally meeting Antoine, my pen pal of three years, I never pictured myself laughing through the empty streets of beautiful Nice, part of this motorcycle gang of French men, racing towards the dark beach. 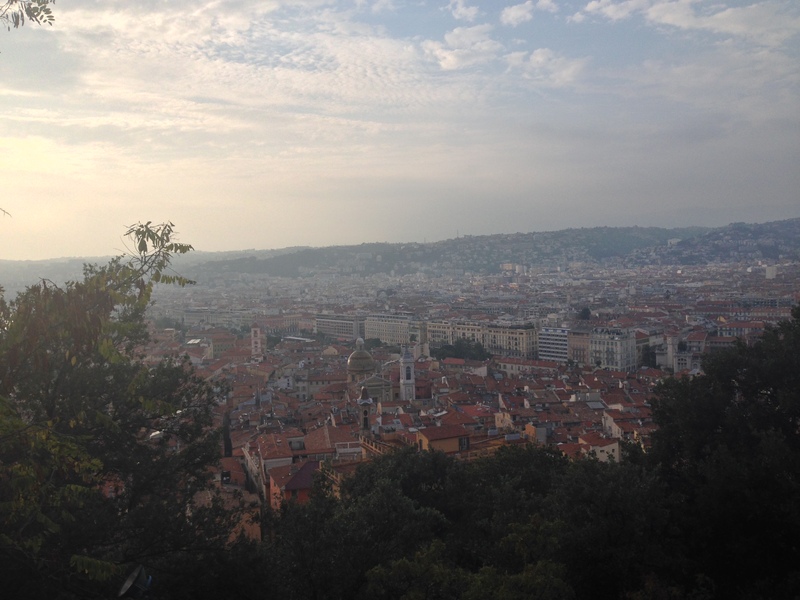 My entry for the World Nomads Scholarship trip about my adventure or misadventure in Nice. When they forget your birthday, smile graciously and let them know you don’t care. It’s just another day. You’re only another year older. It doesn’t matter too much. Yet. They will say all the right things to you. Things that will make you forget that you were kinda sad about the fact that they forgot you were born on this day. They will say how nice you look before placing their hand on the small of your back and bringing you closer. You will smile because you feel special and not used. Okay, maybe slightly used. But, who cares about birthdays. You’re not 21 anymore. When they forget to text you back, reply with an emoji. The one with a straight line for a mouth. Make it seem like you’re only slightly annoyed. Hurt. Unfeeling. Whatever. You will be forever understanding that they were busy and had to play video games or watch some new movie that came out. Their phone wasn’t anywhere near them. Sorry. Sorry. When they forget to meet you for drinks, don’t answer their calls. Hit “ignore” and drink another whiskey and coke, extra lime on the side. Smile with muster at the bartender, call him a “bar keep” because that feels funny to you. When they call your phone again, turn it off and push it to the bottom of your purse. When they show up at your house, wear the skirt that shows too much thigh. Bite your lips too much and only give them ten minutes of your time. Look at your nails too much. Point your toes inward and bounce on your heels. Walk back into the house and wipe at your eyes. Go back to bed. Turn off your phone. Envelope yourself into darkness. When they forget to tell you that they love you too, realize it isn’t because they forgot, it’s because they don’t feel the same way. They’ll look at you and say “thanks” and that will be the end of it. Just nod and take a sip of your drink and walk upstairs without saying another word. Don’t tell them good-bye because who cares. They obviously don’t. They keep forgetting about you.